Step right up and write your best screenplay! Writers once dreamed of writing novels: now it's screenplays. Here's your step-by-step guide to writing AND selling to movies and TV. These three hours are the highlights of Michael Hauge's acclaimed two-day, intensive screenwriting seminar. Listen and learn how to elicit emotion (your primary goal), create strong characters, structure your stories and conquer the business side of Hollywood. INCLUDES ground-breaking information on "feminine mode" movies, a unique approach to character growth and guidance on your life as a screenwriter. Finalist in AudioWorld's 2004 Golden Headsets Awards for Best Self-Help or Inspirational Audio. 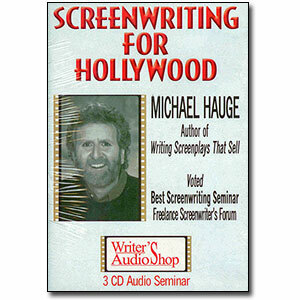 Michael Hauge is a Hollywood script consultant and screenwriter who coaches writers, filmmakers and studio executives. His best selling book Writing Screenplays That Sell has become an industry standard.